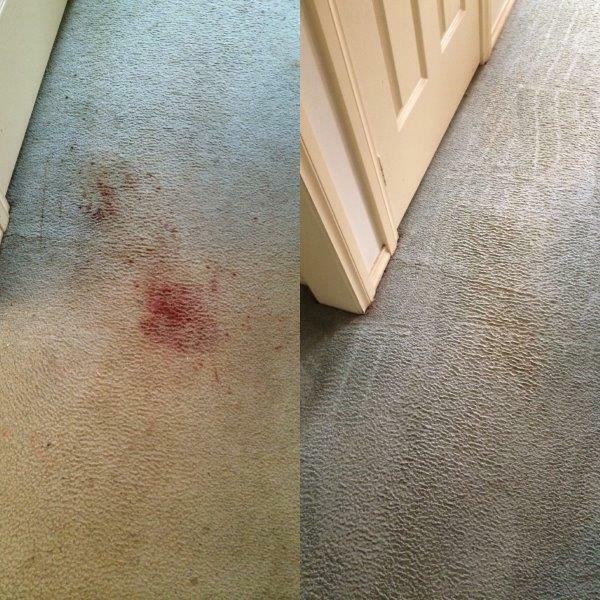 Lately, I have been called out to quite a few jobs where I have been asked how to get blood stains out of carpet. Now don’t get me wrong, they were not gruesome murder scenes or anything like what you see on TV these days. They were just your everyday, run of the mill nose bleed type situations and one was an unexpected home birth!! 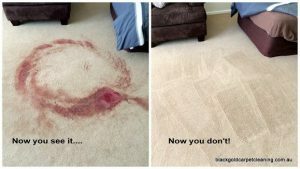 If you have pets or children, you will be very familiar with the types of accidents that result in blood staining your carpet. There is however no need to panic, blood is tricky, but can be removed provided you follow the right steps. This is because, hemoglobin binds to the carpet fibres once it comes into contact with oxygen. 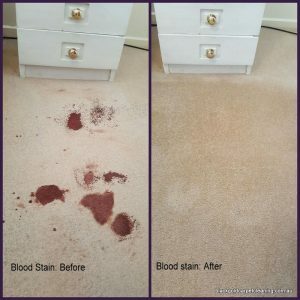 The sooner you can attend to the stain, the better, as wet blood can be removed much more easily than blood that has been allowed to dry and bind firmly to the carpet fibres. I always recommend using a professional carpet cleaner to remove dried blood stains as the protein and enzyme spotters required to shift dried blood from carpet, can be hazardous if you are nor familiar with the correct safety procedures. Some, like ammonia can cause respiratory issues and should be used with extreme caution and in a well ventilated space, followed by thorough rinsing. Then there is also the possible bacteria and pathogens which needs to be considered and any anti microbial treatments used to sanitise your carpet, must be colour safe. Some contain bleach which will remove the colour from your carpet fibre and may cause more damage. Always wear disposable gloves when trying to get blood stains out of carpet. Cold Water:The first step is to dilute the blood as much as possible and the best way to do this is by filling a spray bottle with cold water and misting the water over the stain. 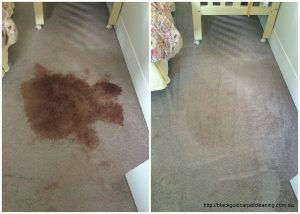 It is very important to use cold water as hot/warm water can set the stain permanently into the carpet fibres. Blot Gently:Take a clean dry cloth or towel and gently blot the stain. Do not rub or you may damage the carpet fibre and actually push the blood further down into the fibres and carpet backing. As the blood transfers onto the cloth fold it over so a fresh, clean piece of the cloth is in contact with the stain. Repeat, alternating the water spray and dabbing for as long as there is colour transfer onto the cloth. Dry: The stain should now be much lighter in colour, if not completely removed. If you managed to get the blood stains out of carpet, dry the area as much as you can by using clean dry towels or even a wet dry vacuum if you have one. A small fan placed next to the stain will also help dry the area or you can place a dry towel over the spot and put something heavy like a glass or book on top and leave it overnight to help the towel absorb the water. Once the area is dry, vacuum the carpet to restore the natural look of the carpet nap. Sometimes blood stains need a bit more of a push before they give up their hold on your carpet fibres. If you find you are left with a light stain after diluting the blood with the cold water method above, you can try something a bit stronger, depending on the type of carpet you have. Or you can call in a professional like Black Gold Carpet Cleaning, we have all the right chemicals, equipment and training to make sure you get the best result possible without any mess or fuss and we can usually get blood stains out of carpet without too much trouble. n remover and a good choice when you want to get blood out of carpet. As previously mentioned ammonia produces strong fumes which can cause breathing difficulties, so always use caution, read the label, use in a well ventilated space and rinse thoroughly. Ammonia should also be avoided if you have pets (especially cats) as the smell of ammonia can cause them to urinate on the carpet. Mix a table spoon of ammonia with a cup of cold water in spray bottle and mist over the stain, then gently dab with a clean dry cloth. repeat until stain has been removed. Then rinse the area thoroughly with cold water and dry with a clean dry cloth. You can put a dry towel over the wet area and place something heavy like a glass or book on top to help the towel absorb the moisture, and leave for several hours or over night. can be damaged by ammonia so we do not recommend you use any spotters containing ammonia on woolen carpet. Instead you can try, mixing 1 teaspoon of clear dish washing liquid with 2 cups of cold water in spray bottle and misting over the stain. Then either dab with a clean dry towel or gently agitate with an old toothbrush (do not rub or apply too much pressure or you may damage the carpet fibres and/or push the blood down further into the carpet backing & underlay). Rinse off thoroughly with a damp clean cloth and repeat if necessary. Dry with a clean dry towel. A fan placed next to the area will also help speed up the drying process. 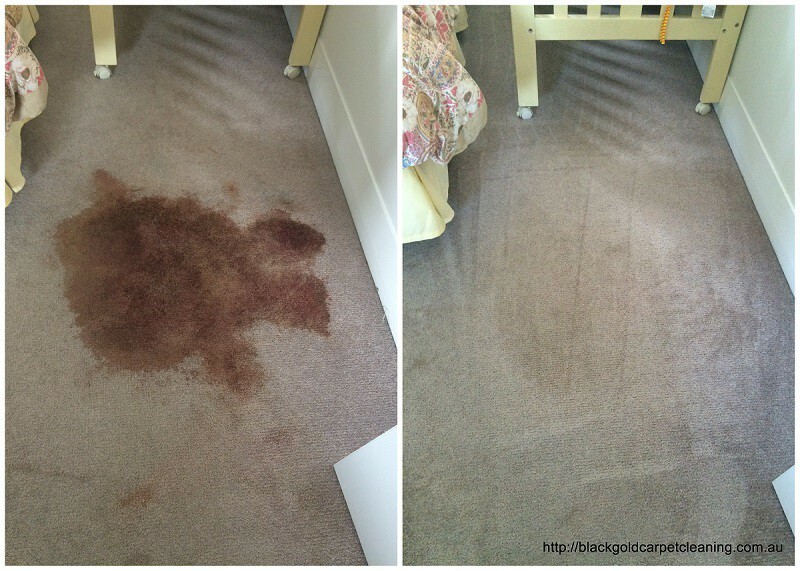 If you cannot get blood stains out of carpet, using these methods or you would prefer to leave it to the experts, then please contact us at Black Gold Carpet Cleaning and we will be happy to help.